Crysta-Glas clear acrylic sheet is a highly versatile product as a replacement for glass. It can be used all over the home and in many commercial and industrial applications. It can be cut, scored and drilled making mounting and hanging easy with minimal tools. Crysta-Glas comes with a protective film allowing cutting and drilling without marking the surface. Simply peel off the film once you're finished for a clear, scratch free surface. Available in 2mm and 4mm thicknesses. Use 2mm for indoor applications and 4mm for external use. 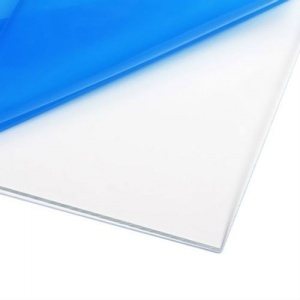 See our list of handy sizes from 1220mm x 610mm (4' x 2') all the way up to 2440mm x 1220mm (8' x 4') sheets.